Jon Bon Jovi has recorded commentaries outlining the meanings or backgrounds behind the songs on This House Is Not For Sale. The commentaries only cover the songs on the standard version of the album though, not the bonus tracks. Anyway, you can find the track commentaries on Bon Jovi's YouTube channel. Leonard Cohen died this week at the age of 82. Jon Bon Jovi, like many other artists, was a great admirer of Leonard's work. In honour of a legend, here's one of my idols paying tribute to one of his. 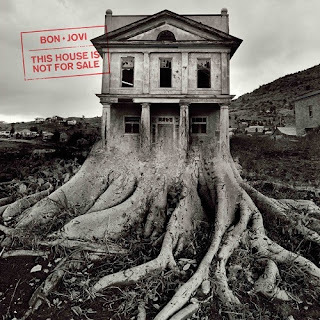 If my timezone conversions are correct, Bon Jovi's new album This House Is Not For Sale should now have been officially released around the world. I pre-ordered it on iTunes so I like to think I contributed to it going to #1 on iTunes Australia, albeit briefly. (At my last check, it was still #2 though.) I also pre-ordered a CD from Japan that's been shipped, so I'm waiting for its arrival. The version of the This House Is Not For Sale that's streaming on TIDAL has a seventh bonus track called "Color Me In". You can listen to it now if you have a TIDAL subscription. An mp3 of the song is also floating around online. UPDATE 11/11/16: US fans can get "Color Me In" on a Walmart-exclusive edition of This House Is Not For Sale. Having listened to the album several times now, I think my favourite tracks are "Living With the Ghost", "Roller Coaster", "Real Love", and "Scars on this Guitar". But I'm enjoying the album as a whole, probably a lot more than I ever expected to after feeling somewhat deflated about What About Now and Burning Bridges (though they both have their moments). What do you think of This House Is Not For Sale? "Come On Up To Our House" is the latest Bon Jovi music video (after "Knockout" and "Labor of Love") to be released as a TIDAL exclusive. John Shanks appears alongside the rest of the band in this video. Watch "Come On Up To Our House" on TIDAL. UPDATE 11/11/16: "Come On Up To Our House" is now on BonJoviVEVO. Watch it on YouTube.